Self-driving cars, deep learning, easy parking: Nvidia's press conference at CES provided an interesting glimpse into how our future on the roads will look. Unlike previous years the press conference was light on technical details. 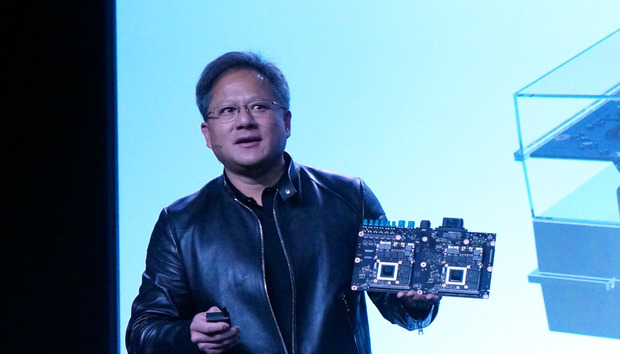 But buried deep inside the hour-long presentation was a momentary glimpse into the company's latest integrated Tegra chip, which could have a significant impact on Nvidia's direction in supercomputing, entertainment and mobile products. Nvidia introduced the Drive PX 2, a lunchbox-size supercomputer for cars that provides the horsepower equivalent of 150 MacBook Pros. Inside the car computer are next-generation Tegra CPUs and Pascal GPUs, which could bring better graphics and smarts to other products like GRID servers, supercomputers and the Shield TV box. The chip in Drive PX 2 may be a mobile processor code-named Parker, which Nvidia has said would ship this year. According to Nvidia's previous roadmaps, the Pascal GPU has new technologies such as 3D stacked memory and the NVLink interconnect, which can bring big performance and power efficiency gains to Nvidia's Tegra chips. The Drive PX 2 chip has two integrated computing modules with 12 CPU cores and two GPUs. Each module had four ARM-based Cortex-A57 and two Denver 64-bit cores and a Pascal GPU. Nvidia's homegrown Denver CPU has returned after it was abandoned in the previous Tegra chip, called X1, which had prior-generation Maxwell GPUs. Lighter and lower-power variants of the Drive PX 2 chip could be used in Nvidia's Shield TV set-top box, which doesn't require as much horsepower as a car or supercomputer. Implementing a variant of that chip in one of the company's Shield tablets is less likely as Nvidia is moving away from mobile products, said Jim McGregor, principal analyst at Tirias Research. Nvidia's drive to get into high-performance computing and machine learning suggests an unprecedented pairing of Tegra CPUs with Pascal GPUs for more powerful servers and supercomputers, McGregor said. Some of the fastest computers in the world already have Nvidia GPUs for complex calculations, but are paired with Intel CPUs. The new Tegra CPU and Pascal GPU could give Nvidia a full package of chips for ARM-based supercomputers. The chip in PX 2 also has some "deep-learning" instructions, which can process large data sets and build predictive models to spot and recognize trends. For example, self-driving cars with Drive PX 2 can be trained to recognize objects, signs and respond to on-road situations. The same deep-learning models could be applied to areas like financial forecasting and health, where high-performance computers with Nvidia's new chips could fit, McGregor said. Nvidia is building its own machine-learning system for cars, and its GPUs are already being used in deep-learning systems from Facebook, Google, Microsoft and IBM. The Drive PX 2 delivers about 8 teraflops of performance with the new chips, a significant improvement over the Drive PX 1, which had Tegra X1 and clocked in at 2.3 teraflops. Some of the improvements also come from the 16-nanometer FinFET manufacturing process, which has helped cram more features and bring more power-efficiency to the chips. Transistors will be stacked on top of each other in the chips. In the detailed talk about self-driving cars and the Drive PX 2, Huang left the new Tegra CPU and Pascal GPU as a side note. Drive PX 2 is "not a chip strategy, it's not a processor strategy," but more of a strategy to build full computers for cars and other products, Huang said. But there's a possibility Nvidia could spill some technical details on the new chip later this year.